Beethoven's Symphony No. 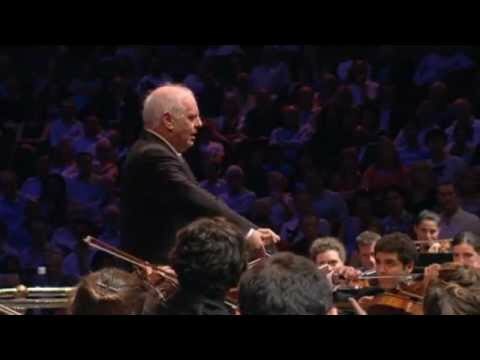 5, performed by the West-Eastern Divan Orchestra, conducted by Daniel Barenboim. Please listen to the first movement of this symphony. How would you describe the music of Beethoven? Please write down your thoughts! Now please read the following four paragraphs taken from E.T.A. Hoffmann’s 1813 article, “Beethoven’s Instrumental Music,” adapted from his 1810 review of Beethoven’s Fifth Symphony, published in the music periodical Allgemeine musikalische Zeitung in Leipzig! E.T.A. Hoffmann (1776-1822) was a writer of fantastical tales, a music critic, a composer, and an artist. When we speak of music as an independent art, should we not always restrict our meaning to instrumental music, which, scorning every aid, every admixture of another art (the art of poetry), gives pure expression to music’s specific nature, recognizable in this form alone? It is the most romantic of all the arts—one might almost say, the only genuinely romantic one—for its sole subject is the infinite. The lyre of Orpheus opened the portals of Orcus—music discloses to man an unknown realm, a world that has nothing in common with the external sensual world that surrounds him, a world in which he leaves behind him all definite feelings to surrender himself to an inexpressible longing. That gifted composers have raised instrumental music to its present high estate is due, we may be sure, less to the more readily handled means of expression (the greater perfection of the instruments, the greater virtuosity of the players) than to the more profound, more intimate recognition of music’s specific nature. Thus Beethoven’s instrumental music opens up to us also the realm of the monstrous and the immeasurable. Burning flashes of light shoot through the deep night of this realm, and we become aware of giant shadows that surge back and forth, driving us into narrower and narrower confines until they destroy us—but not the pain of that endless longing in which each joy that has climbed aloft in jubilant song sinks back and is swallowed up, and it is only this pain, which consumes love, hope, and happiness but does not destroy them, which seeks to burst our breasts with a many-voiced consonance of all the passions, that we live on, enchanted beholders of the supernatural! The musical rabble is oppressed by Beethoven’s powerful genius; it seeks in vain to oppose it.But knowing critics, looking about them with a superior air, assure us that we may take their word for it as men of great intellect and deep insight that, while the excellent Beethoven can scarcely be denied a very fertile and lively imagination, he does not know how to bridle it! Thus, they say, he no longer bothers at all to select or to shape his ideas, but, following the so-called daemonic method, he dashes everything off exactly as his ardently active imagination dictates it to him. Yet how does the matter stand if it is your feeble observation alone that the deep inner continuity of Beethoven’s every composition eludes? If it is your fault alone that you do not understand the master’s language as the initiated understand it, that the portals of the innermost sanctuary remain closed to you? The truth is that, as regards self-possession, Beethoven stands quite on a par with Haydn and Mozart and that, separating his ego from the inner realm of harmony, he rules over it as an absolute monarch. In Shakespeare, our knights of the aesthetic measuring-rod have often bewailed the utter lack of inner unity and inner continuity, although for those who look more deeply there springs forth, issuing from a single bud, a beautiful tree, with leaves, flowers, and fruit; thus, with Beethoven, it is only after a searching investigation of his instrumental music that the high self-possession inseparable from true genius and nourished by the study of the art stands revealed. Here is the first page of the 1813 publication, and a link describing the Allgemeine musikalische Zeitung. What might these publications tell you about their readers? Pick a sentence that you like and read it out loud! What effects does his writing create? How does his use of language itself seem to reinforce his points? How persuasive do you think his writing was in 1813? What are Hoffmann’s attitudes regarding the relationship between composer, music, performer, and audience? So what exactly does Hoffmann value in the music of Beethoven? In an upper-level course, you might look at this text again, considering new questions and also reconsidering the very same questions you asked before. What exactly is the nature of the relationship between Hoffmann’s ideas and the music of Beethoven? How might Hoffmann’s words have shaped reception of Beethoven’s music? And what are the implications of this possibility? How do Hoffmann’s ideas resonate with philosophical thought at the turn of the 19th century? Are there things that music can express that words cannot?